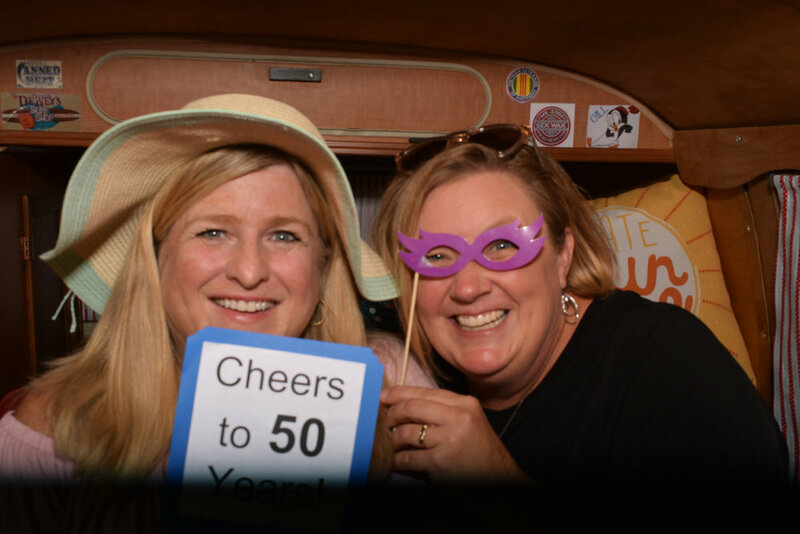 Bob’s Photobooth Bus is the most distinctive way to make your event unforgettable. 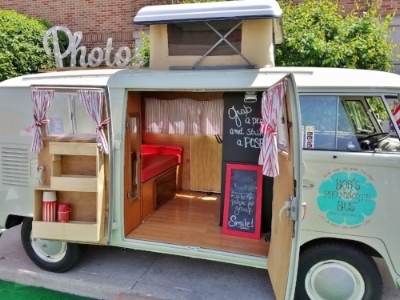 Our mobile photobooth is inside our 1967 VW Bus -Spicoli. He’s the life of the party, blowing guest’s minds with his groovy interior, iconic split window & stamped V front design bringing a smile to your face. From classy to casual, we can deck out our bus to fit your event. Chicagoland's only mobile photobooth VW bus is available for weddings, birthdays, proms, private parties, corporate events, grand openings, festivals, fundraisers, class reunions, trade shows, anniversaries, block parties, product placements, photo shoots, movies, commercials, etc.....the possibilities are endless. 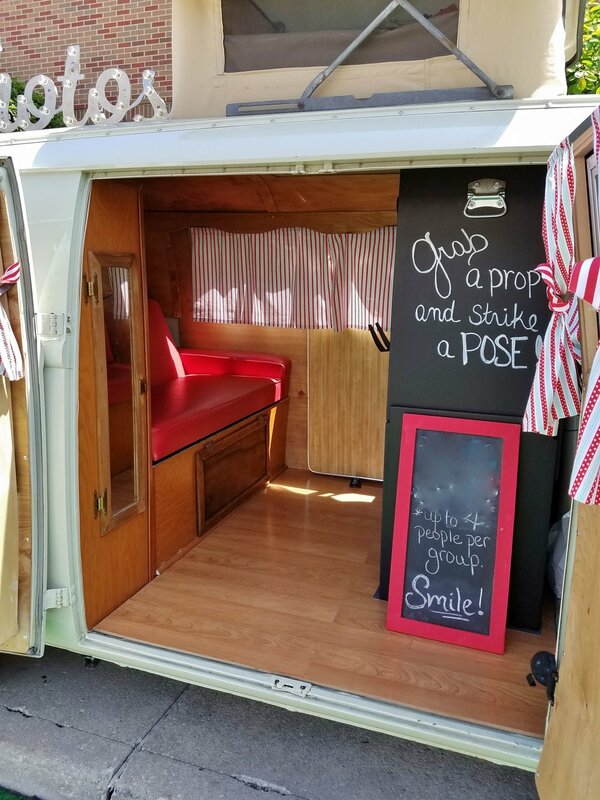 A vintage photobooth in a vintage VW Bus is a wildly entertaining way to create and capture all the fun for guests of all ages. It's a great attention-getter and as easy as 1, 2, 3. We cruise our VW Bus to your venue. We stage our photobooth bus, creating a nicely complementing your event vision. We open the side doors to an inviting, easy to use, do-it-yourself, retro photobooth. "You’re either on the bus or off the bus”. How do you want to do this? *Travel surcharge may apply. See Below for Rental Details and radius map. - 2-Hour rentals are possible but only for nearby events on weekdays (Monday-Thursday), weekend afternoons or special circumstances for $595. Perfect for shorter events. Call to see if its doable. - Longer rental periods available. Call for a quote based on the time period. - Available for movies, commercials, photo ops, product placement, styled photo shoot, etc. - call. Call or email me to confirm your date, ask me any questions & then.....book it! All bookings are done directly. Book it with Bob by email or phone. bob@bobsphotoboothbus.com or 773-388-2000. I enjoy creating fun times, giving people a break from the day to day grind of life. It supports my attempts to be a humorist via my satirical blog and book writing career to avoid being a true starving artist. See https://www.bobjoketoomuch.com/ for these attempts, complete bio (as a sleep aid) and my first book....soon. My beliefs & mission for my business can be summed up by Zachary Fisher, a philanthropic benefactor for our military forces. Yours truly with my new ride - “Spicoli”. Spocoli is named after the laid-back surfer dude, Jeff Spocoli, in the movie Fast Times at Ridgemont High & fellow 67 VW Bus owner. 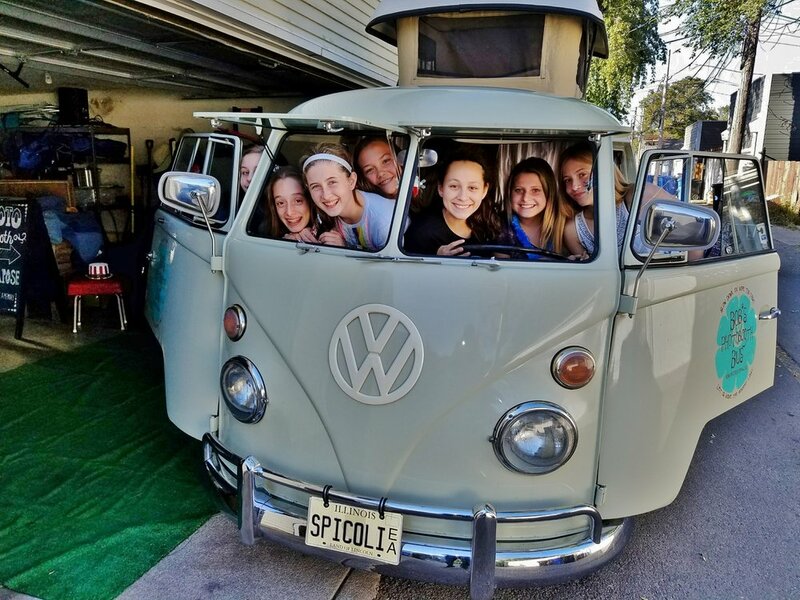 Spicoli is a 1967 VW split window bus, “Splittie”, that started out as a panel van and was converted by Riviera Motors to a camper. The bus sports a classy pearl white paint, pop top roof and tilt out front windows. He lived his last 50 years in several locations including Seattle, Washington (Imported), Portland, Oregon (Riviera Camper Build-Out), St. Petersburg, Florida, Peyton, Colorado and now Chicago, Illinois. He was born on February 21, 1967, in Wolfsburg, Germany and now an AARP member. Spicoli is just looking to goof off and provide fun times in the Midwest while also giving me a material source for my burgeoning writing career. The Bus maintains most of its original interior with birch trim, gray front seats and red vinyl back seats. Updated with new tires, transmission, rebuilt engine and front disk brakes. My brother and I slowly cruised with him back from Peyton, Colorado (where I bought him) on a 1,300-mile road trip with no issues. Spicoli being born just months before the start of "The Summer of Love" has been apt to donate or discount his services to charitable organizations. See "why we do it" for details. The Volkswagen Type 2 T1 was the first generation of the split window bus. It is commonly known as the "Splittie." Production began in March, 1950 & lasted until 1967. 14’ long, 5’-7” wide & 80” high. Body style: Started as panel vans. 1967 was the last year of production for this iconic design and replaced with an uninspiring bay window design. Video Walk Around Bob's Photobooth Bus at Randolph Steet Market Festival. Click on Picture to view. Custom Guest Book – Quoted based on book or provide your own. Rates are quoted for a minimum time frame, we charge whether you are able to use the full time or not. The rental period is for a continuous operating time with no option for breaks. You may book Bob’s Photobooth Bus for additional time. Additional or overage rates are $300 per hour/$150 per half-hour. 2-Hour rentals are possible but only for nearby events on weekdays (Monday-Thursday), weekend afternoons or special circumstances for $595. Perfect for shorter events. Call to see if its doable. Longer rental periods available. Call for a quote based on the time period. The weekend evenings are reserved for our prime-time packages starting at 3-hours, but call just in case we have last minute availability. Bob’s Photobooth Bus is already very popular. We are booking dates fast and work on a first come first serve basis so don't wait to secure your date! We take reservations up to two years in advance and as late as the week of the event, subject to availability. See booking calendar for available dates. We have three-travel radiuses with minimum rental periods. Travel for round trip mileage from 27-36 miles(5-hour package), 17-26 miles (4-hour package) and 0-16 miles(3-hour package) to and from our location in Chicago – 60618. Any event farther than 36 miles round-trip will incure a $5.00 per mile surcharge. Mileage is calculated using Google Maps and quoted in advance of reservation. See radius map under booking information for a rough estimate of our round trip areas. Call to confirm. A gratuity for your friendly Photobooth concierge is your call but always appreciated. We will go above and beyond - no matter what! Minimum 10 x 18 ft. area (Bus is 6’ wide x 14’ long) for setup & operation, indoors or out and a power outlet within 100 ft. or generator. Generator (if needed) - $75. Access to set-up a minimum of 1-hour before our rental start time. 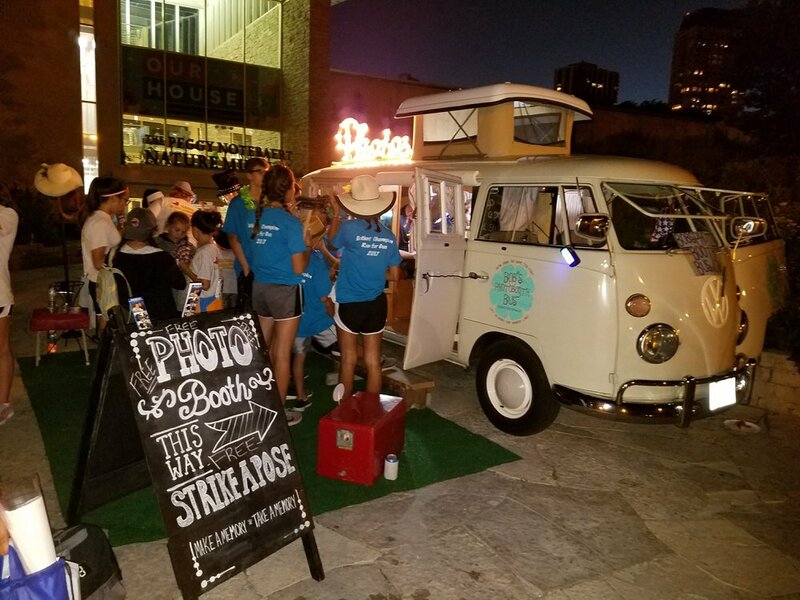 If the Event space fails to provide access and space as promised, Bob’s Photobooth Bus will not be responsible for the change of location or cancellation. IF MY EVENT IS INSIDE, DOES BOB’S PHOTOBOOTH BUS HAVE TO STAY OUTSIDE? Not necessarily. Access for indoor setup requires a 6’ wide by 80” high access point and approval of the venue for a 3,000 lbs. vehicle. It's surprisingly light, similar to a Toyota Prius. Minimum 10x18ft area (VW Bus is 6’ wide x 14’ long) for setup. If it’s tight, we might be able to squeeze it in. In the event of inclement weather where we can't operate the booth outside, we should be able to move the equipment inside (minus the bus) to set up an open booth, if space is available. The van's (Bus) going to be a rockin' so you best come a knockin'. We show up rain or shine, hopefully just like your guests. 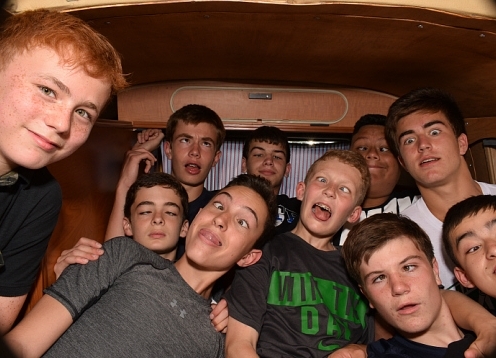 The Photobooth fun takes place in the VW Bus so you can keep out of bad weather during your glamour moments. We also bring pop-up tent canopies to protect the guests as they ready for pictures outside the VW Bus. The convenience of getting to and from the Photobooth Bus depends on how close we can set up to the indoor venue. We will do everything in our power to shield your guest from the elements if Mother Nature sock’s it to us. 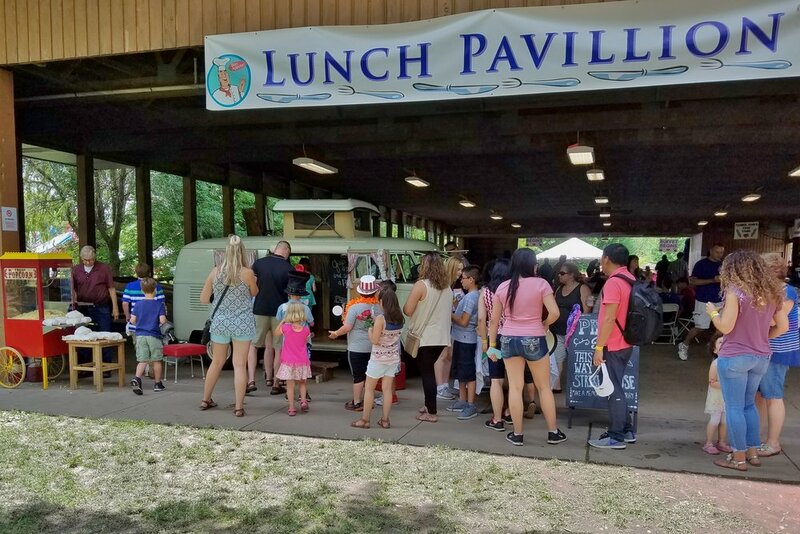 If it is impossible to operate the booth due to severe weather as determined by the Bobs Photobooth Bus, during an event, we should be able to move the equipment inside (minus the bus) to set up an open booth, if space is available. There is no guarantee of this but the customer will be partially refunded if a large part of the event was not used. If the majority of the time frame was served, there will be no refund. CAN WE CHECK OUT IN PERSON BOB’S PHOTOBOOTH BUS PRIOR TO AN EVENT? No biggie! You can see it, either at an event or in his crib. 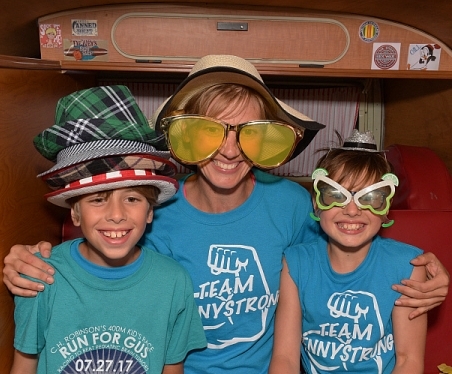 We attend many local Chicagoland events so you can experience our Photobooth for yourself. All of our public events are listed on our Website and social media sites. If you are unable to go to one of the events, we would be happy to arrange a time to show you and maybe even go for a little cruise. All of our packages include printing unlimited photos on-site at no additional cost! You get two; 2” x 6” photo strips per sitting with no limit on how many times you can come back for more photo fun. If printing problems occur during the event and we cannot provide prints at the event, we will mail copies of all photos to the party’s contact and give a $100 refund. DO YOU POST THE IMAGES TO SOCIAL MEDIA? I'm old but I'm "with it." We always post the images for social media sharing. We upload your photos to a privately linked webpage on our Website so you - and your guests - can share them, print them or upload them for personal use. We reserve the right to post photos of your event for marketing purposes on our website but we will always as you for permission first. Absolutely! We will personalize them for each event, whether it's a wedding, birthday party, fundraiser, etc. or just because! You can also choose the photos to be full color, black and white or sepia tone for a traditional, classic or retro touch. We are all about creating memories, so we are so happy to "do it your way" to create a far out event, just give us a couple weeks' notice. HOW MANY PEOPLE CAN FIT IN THE PICTURE? Typically 2-6 people, maybe more or 67 clowns. Sure can. Many guests prefer to have the natural background of the VW Bus but it is always your choice. We will match our Photobooth background to your colors or theme! We can provide a selection of basic backgrounds to choose. Let us know what you are looking for and we will send you options. You can also provide your own and we will send you our size specifications. HOW MANY RIGHTEOUS BUCKS WILL IT TAKE TO RENT BOB’S PHOTOBOOTH BUS? See the Info and Pricing section for those details. For other hourly packages call for a proposal. CAN YOU DRIVE THE PHOTOBOOTH BUS? In your dreams. Sorry, it’s an insurance thing. We do however always drive the VW Bus or push it (VW Joke) to events. I have been an entrepreneur successfully running my own real estate business for over 35 years. I know how to work with people to their satisfaction and operate a well-run business. Before starting Bob's Photobooth Bus - I did my homework, bought the best supplies, equipment and photo software to provide studio quality photos, not to mention we bought the most iconic and coolest VW Bus ever made, the “Splittie.” I work hard to bring you a personal touch, be responsive to your inquiries, communicate and execute a hassle-free, fun and a unique experience. You deal directly with me, the owner. I am confident we will exceed your expectations. WHY A PHOTOBOOTH IN A VW BUS? Because there a flippin' good time! 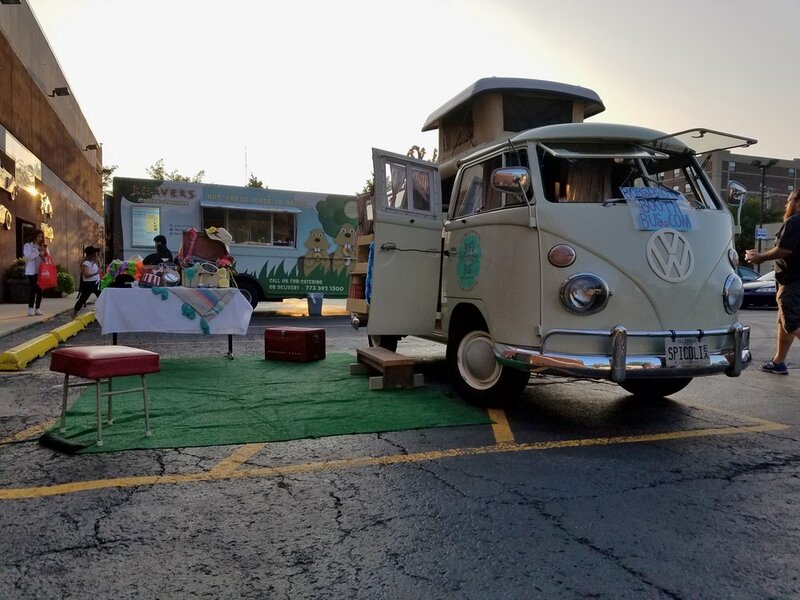 These iconic VW Busses’ just seem to cause people to break out in smiles, so why not create fun memories, do some good, and make some dough all at the same time? I also need to justify my purchase of the VW Bus to my bewildered wife. CAN YOU SET UP A NORMAL PHOTOBOOTH? Normal! Who wants normal? At the moment, I do not unless inclement weather prevents us from using the bus as the photobooth. If that happens, we can move our equipment inside and use it as an open photobooth if you have a spot for us. I have some crazy idea's running around my brain, so it’s a possibility in the future that we offer a separate booth for inside events. Heck yeah! 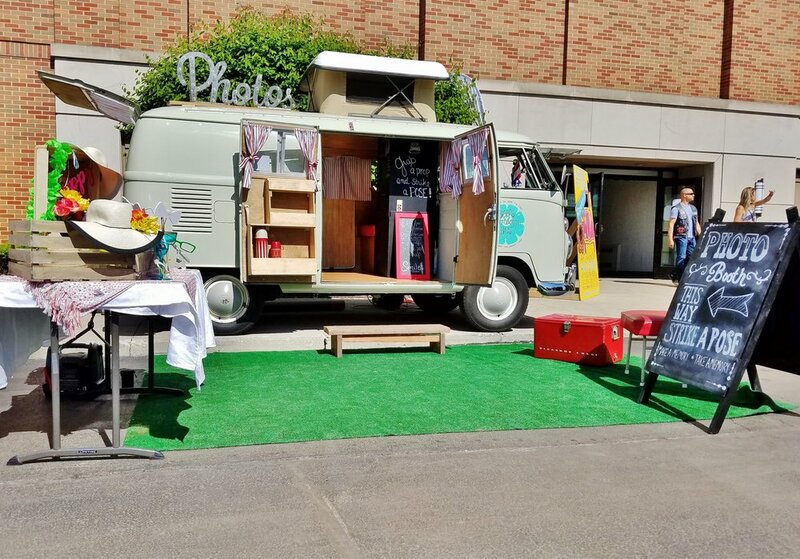 Bob’s Photobooth Bus travels to events in the Chicagoland area at no additional cost within our radius map (see rental details for complete info and map). If you're curious about having this unique photo booth at your event outside of the Chicagoland area let us know and we'll see what we can do. You never know when Spicoli will let it all hangout and yell, “Road Trip”! WHAT IF I'VE FALLEN & I CAN'T GET UP? Please understand that Bob’s Photobooth Bus is a unique vehicle. He's a 50 plus-year-old VW Bus. They have been known to break down, start on fire, be stolen, get in accidents, etc. In the case of a mechanical problem we usually can fix it or get it towed to the event with little or no interruption to your rental period. In the unlikely event that Bob’s Photobooth Bus suffers any of these unfortunate situations and can’t make your event, we reserve the right to cancel as soon as we know the situation. Renter will have no recourse. Any payments you have made will be refunded in full with an offer to rent it at another time for a 20% discount as a way for us to say sorry for having to cancel. In the unlikely event that guests become abusive to our attendant, equipment, supplies and/or bus, we reserve the right to shut down the Photobooth and the customer waives any right to a refund. As I said, this is unlikely but it has to be stated for that one tenth of one percent chance of it happening. If there is an issue, you will be notified and we will make every effort resolve it with you so we can avoid shutting down and leaving. The final decision will be at our discretion. The customer booking the event will be responsible for any vandalism guests perform toward the bus during the event. In the event that something does happen, the customer booking the event will be responsible for paying any money owed to Bobs Photobooth Bus to repair damages. It's up to the customer to deal with the person(s) responsible for vandalizing on their own time and terms. Have the Photobooth available early in the event like the cocktail hour at a wedding. Guests are often looking for something to do early on, and the curiosity factor is high. You get more bang for your buck starting early than going late when most guests are focused on other portions of your event. If possible, locate the Photobooth as close to the action as possible. You want the guestbook to be full and your guests to go home with a stack of photo-strips. The closer the booth is to the bar, dance floor or event center, the more use it will get. Think through beforehand who you want to get in the booth with at your event. You’d be surprised how many guests forget to go in the booth because there is so much going on. Don't let them miss the fun. If you are picking out your own album for a photo guest book, I recommend using one with black pages – at least 20 of them. The photo strips and metallic gel pens for messages look fantastic on black pages. If you are using the photo-strips as your primary wedding favor, consider having the strip customized to include your names and the date – or a special message. Tailor the photo strips to fit with the mood you are trying to set with your event. Color strips always look great but we can also make them black and white, or sepia tone for a classic or retro touch. To take your photo-strip wedding favors to the next level, place 2”x6” acrylic, photo strip frames at each place setting or some other style of 2”x6” frame. We can arrange it and let you know the cost. At the end of the rental period, all the images will be placed on a USB flash drive to be used however you see fit. Think about projecting them onto a screen for all to see toward the end of the event. Consider having duplicates of the photo-strips printed out later to be included with thank you notes, birthday cards, holiday cards, etc. As you consider your options: make sure you are comparing apples to apples. 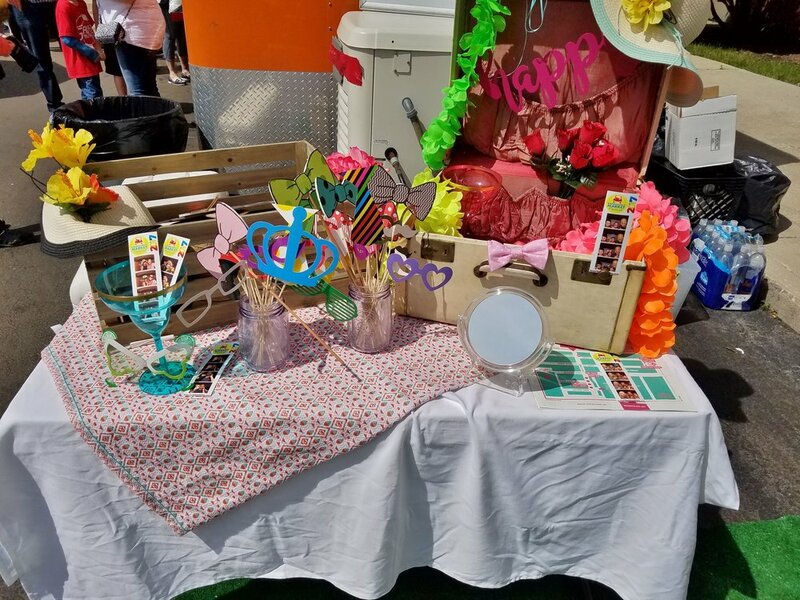 Not all photo booths are created equal – there is a photo booth for every price point – from “photo booths” that are assembled with pipe and drapes or a tripod and a backdrop, to upscale, authentic, hard-sided photo booths. 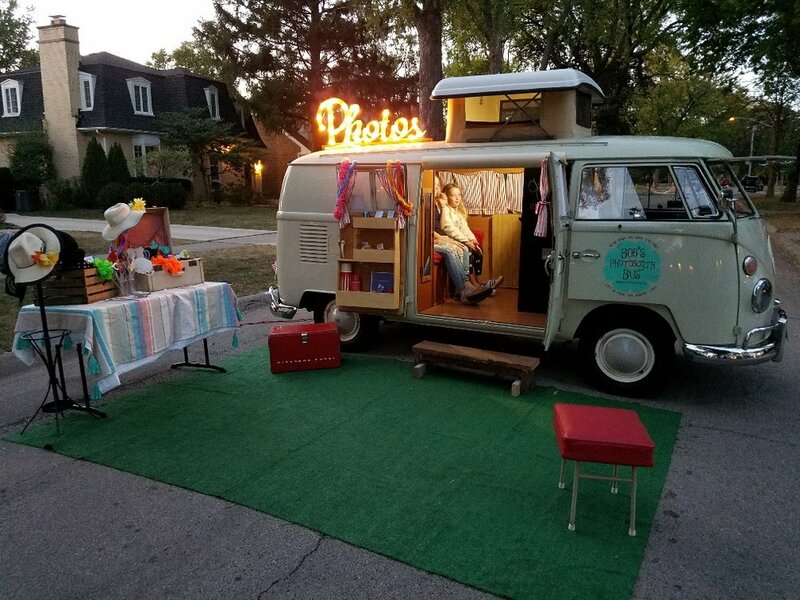 Bob’s Photobooth Bus is not only a one of a kind Photobooth in the Chicagoland area but everything is done in a top notch, professional manner. Ask for a sample of the photo strips they provide. Not all photo-strips are created equal. Our images are printed on top quality photo paper using a state of the art dye sub & thermal photo printer. The high-end camera equipment and lighting produce fantastic looking, long lasting photos. Regarding props. If you go with them at all, go light. Going overboard with the props will result in a couple hundred strips of nearly anonymous people dressed up in the same costume. The magic of Bob’s Photobooth Bus happens when guests pose for their pictures in this unique VW Bus and another side of your guests’ personalities shine. You want as much of the real them as possible, I think.